This quote together with some drawings are from the excellent book “Vele Italiane della Costa Occidentale” by S. Bellabarba and E. Guerreri, published by Hoepli in Milan in 2002. 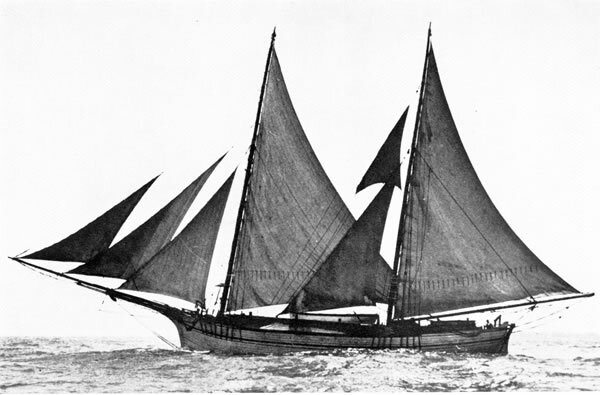 A Lebanese cargo gulet under sail . Here we have a 100 feet or so ship. Strictly she is not a gulet, as she has a transom and her rudder is external. She is Marconi rigged and therefore the main boom is overhanging the transom by about 15 feet. The gaff rigged gulets have much less overhang. Note the huge bow sprit and the “velene” or the staysails. Note the tiny figure just ahead of the main broom gallows, as well. He is the helmsman! And he steers this enormous vessel on a tiller! A well ballanced vessel, indeed. Note her rather steep forefoot. The gulet is a cargo and fishing ship of the Mediterranean. It survives in the Eastern Med up to our days and Bodrum is certainly the centre for having a gulet built. 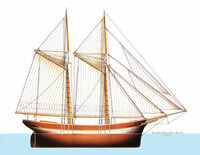 The lines of this type of ship has always attracted many boat designers, including for example the famous British designhouse of Laurent Giles. Nevertheless none of these boats come up with the flaire achievable through the legendary master shipwrights of Bodrum. However, not all glitter is gold, and so it is also with the gulets. • Traditionally the Bodrum Gulets are made “pine on pine”, utilizing the red pine (Pinus brutia Ten. ), popular in our area. This is inherently not a very durable choice of wood and gulets rot in particular in the badly vented aft quarters. Recently more and more exotic woods like “khaya” or even “sapelli” are utilized. But also these woods cannot be used throughout the boat and certainly keel, stems, frames and stringers must be made out of more suitable timber. • As almost no “crooks” are available any longer, frames and the stems are usually laminated now. However, with the planks still caulked in the traditional manner the resulting “hybride” is not a satisfactory construction and gulets may end up humid and at times leaking boats. • Almost always the construction is made with galvanized iron nails and with iron bolts and coachscrews. Bronze and copper are unheared of. The ferrous elements have a life expectancy of, say 10 – 15 years and even before this period the owner is forced to refasten the planks and, where and when this is not possible to accept a leaking “softened” boat. • In recent times, in order to squeeze in more and more paying passengers into the boats, very unsighty superstructures and unseaworthy flaring ends have been added to these beauties. yachtWORKS would be very pleased to assist and advise interested parties in the design and supervise the construction of the finest of traditional sailing boats here in Bodrum and confidently we can assure, that you will end up with a jewel impressing next to yourself anybody with a heart for sea and sail. The “goletta” as seen by Edouardo Guerreri. She is a two masted schooner and like with all schooners the drive is given by the overhanging mainsail and by the numerous jibs. She has a clipper bow, almost vertical under the waterline and she has a clipper stern. Her deck is flush, emphasizing her exceptionally beautiful shear.